A selection of the best outdoor toys for toddlers. Girls and boys aged 1, 2 and 3 will have lots of fun with these toys in the backyard or park. I'm Mom to two small boys who love playing outdoors when the weather is nice. I've also got nephews and nieces and get to visit friends with toddlers too. This page is based on my experience of the toys that little ones enjoy most. And also offer great value for money and practicality. I've included a range of toys to suit different interests and budgets. A sandbox is probably the best outdoor toy for a toddler. They can spend hours happily digging in the sand, filling up buckets with sand and maybe even learning to make a sandcastle. There are lots of different styles of sandbox available, but for toddlers, I like the Step2 Crabbie Sandbox. 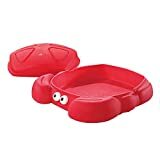 It's a plastic sandbox with a molded lid. My nephew has a sandbox like this and it's very practical. You just pop the lid back on after play and it keeps out cats and the weather. When you've got a toddler running around you don't want the hassle of a cover that's tricky to secure. 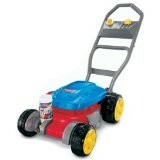 Whenever I've been at a house or play group where there's a toy lawnmower kids always gravitate towards it. Toddlers love to push things along and they love to imitate adults. The Fisher Price Bubble Mower is a classic toy that lets kids pretend to mow the lawn and blow bubbles at the same time. Brilliant! Toddler love to think they're helping and a bubble mower will keep them busy with their yardwork while you get on with yours. 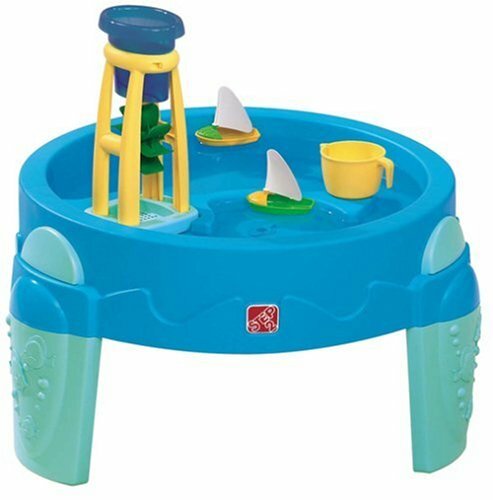 The water activity table was definitely one of the most played with toys in our backyard when my boys were toddlers. We set it up on the patio and they would spend ages splashing around. The Step2 WaterWheel Activity Play Table is a very popular water table with a molded design. There's a water wheel which is always fun! And you get two toy boats - something to float on the water is a must. This water table is suitable for kids from 12 months up to around 4 years old. A basketball hoop is a great toddler toy for developing motor skills and coordination. They'll also burn of energy running around retrieving the ball. The Fisher-Price I Can Play Basketball set is a good choice because it starts off at a low height suitable for kids of around age 2 and then it gets gradually taller as your child grows. I do like toys that will last and don't need to be replaced when kids get bigger. Toddlers will have lots of fun trying to get the ball in the basket, and will be developing useful skills too. Another good sports idea for toddlers is a T-ball set. 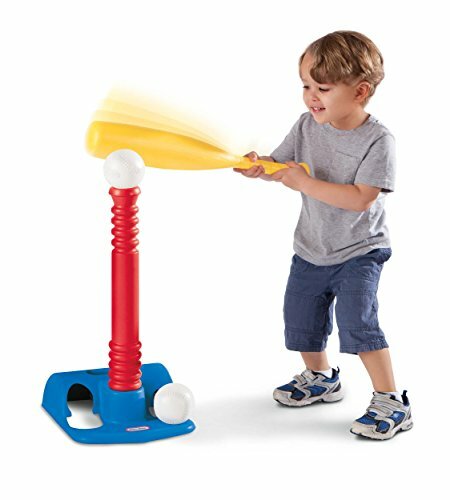 The Little Tikes TotSports T-Ball Set is designed for kids from age 18 months to 4 years with a big bat and ball and bright colors. Of course your toddler will need someone to play T-ball with so make sure there's a willing adult or older sibling to join in. Getting some T-ball practice in as a toddler will set your child up well for playing sports when they're a bit bigger. Kids love ride on toys and scooters. A lot of scooters are too big and a bit dangerous for younger toddlers. 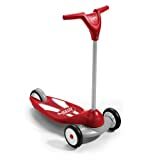 The Radio Flyer My 1st Scooter is designed for kids aged 2-5. 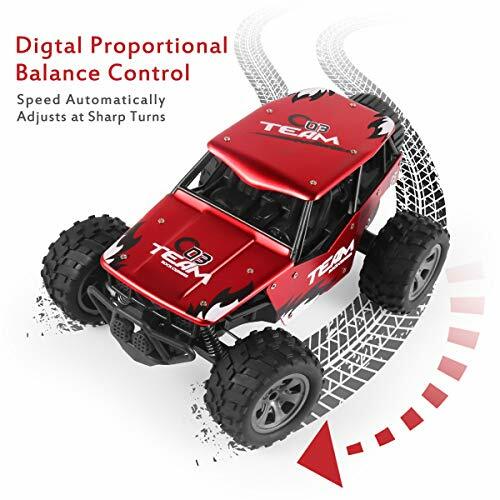 It has a big platform and two big wheels at the front for stability. It folds in half for storage which means you can easily pop it into an outdoor storage box for easy access. You can pop it in the trunk of the car too to take with you on trips. Do you have a favorite outdoor toy for toddlers?